Bahir Dar University (Bahir Dar, ET). The work done under Sam’s supervision at AAU in wireless applications was considered ground breaking and resulted in several patent applications and entrepreneurial undertakings. Further, eight publications have resulted from these collaborative works. Currently a Lecturer at Grad School of Telecom of the Eth. Telecom Corp/ Unity University. Thesis: “Unicode-based wireless java application for SMS (Short Messaging Service) in a multi-language/script Environment using J2ME”. Publication: Ethiopic Keyboard Mapping and Predictive Text Inputting Algorithm in a Wireless Environmnet. ETC Conference, Sep 2004. Thesis: Design of Architecture and Implementation Issues for a Terrestrial & VSAT based National Telemedicine Network. (download). Lemma, F, Denko, M.K. Tan, J., and Kassegne, S.K, “Envisioning a National E-Medicine Network Architecture in a Developing Country: A Case Study,” Int. J. of Healthcare Information Systems and Informatics, 3 (1), pp 44-62, Jan-Mar 2008. (download). “Design of Architecture and Implementation Issues for a Terrestrial LAN & VSAT-based National Telemedicine Network in Ethiopia. Biomedical Informatics Conference in San Francisco, CA – Sep 04. Survey of Current Efforts and Potentials in Application of Telemedicine in Ethiopia, ETC Conference, September 20, 2004. Novel Architecture Design and Implementation of Telemedicine in Ethiopia. ETC Conference, September 20, 2004. Lemma, F, Denko, M.K. and Kassegne, S.K, “Hierarchical Model Based LAN Architecture & VSAT-based WAN for a National Telemedicine Network in a Developing Country”, Proceedings of WCIT 2006, held in conjunction with WCC 2006, August 2006, Santiago, Chile. Currently a software engineer with Microsoft, Seattle, Washington. Thesis: Modeling RBS moment connections and panel zone behavior through MPC & Mixed element based approach. (download). “Multi-Point Constraint and Mixed element based approach for RBS and panel zone modeling”, EACE Journal, September 2004. Hailu, D., Zekaria, A., Kassegne, S.K., “A New Efficient Multiple-Node Constraint Approach for FEA Analysis of Radius-Cut RBS Moment Frames in Highly Seismic Areas,” Proceedings of the Joint EACE-AAU International Conference on Computational Mechanics, Structures and Earthquake Engineering (ICCMSE-2003), January 9-10, 2003, Addis Ababa, Ethiopia. “Investigation of High-Frequnecy Wide Pass-band Tunable MEMS Accelerometer,” Seminar (by Berhanu Kebede Wondimu, recent graduate from our group), ME Department, Bahir Dar University, Bahir Dar, ET, December 2008. “MEMS Devices: Overview and Research and Commercialization Trends,” Seminar, ME and ECE Departments, Bahir Dar University, Bahir Dar, ET, June 2008. “Closed-form 3-D Beam FEA for Modeling Steel Buildings with RBS Moment Connections,” Seminar, Civil Engineering Department, Addis Ababa University, July 15, 2007. “Trends in Computational Mechanics and Finite Element Methods” – Mechanical and Civil Engineering Departments, Addis Ababa University, January 2002. “Recent Advances in Computer-Assisted Structural Dynamics and Seismic Design” – Eth. Civil Engineers Association, January 2002. “Extensible Markup Language (XML) Localization Issues” – Computer Science Department. Addis Ababa University, January 2002. “Simulation Issues for MEMS and Nano Devices” – Electrical and Mechanical Engineering Departments, Addis Ababa University, December 2000. “Computational Methods and Finite Element Analysis for Earthquake Engineering” – Civil Engineering Department, Addis Ababa University, December 2000. Thesis of Shiferraw Abebe of AAU supervised by Dr. Kassegne resulted in a start-up company called Feedelix in 2005. Feedelix introduced a carrier independent text and mobile messaging platform for global use. 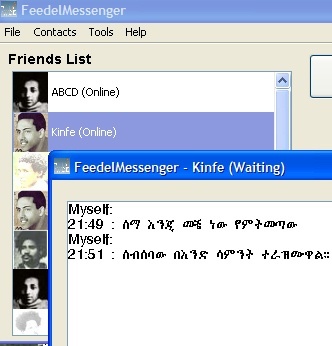 Developed by the team behind ‘Ethiopic Keyboard Mapping’ (Sam Kassegne & Shiferraw Abebe), Feedelix was positioned as “SMS with no boundaries” (predating WhatsApp & Viber) with Hindi, Ethiopic, and Simplified Chinese language localization – in addition to English.